Cocktails by the beach or shopping splurges in cities – there is no right way to celebrate the festive holiday in the Americas. If you are looking for ideas to change up your Christman trips in the Americas this year, look no further! 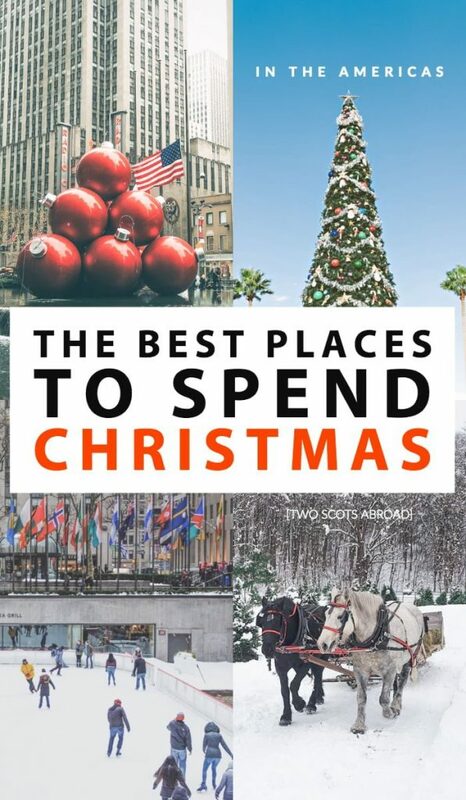 We (Gemma and Craig) have asked fellow travel lovers and experts where the best places to spend Christmas in the USA, Canada, Central and South America are. If you’ve been nice, Santa will still find you even if you are by the pool, at the poker table or pulling crackers in a winter wonderland! 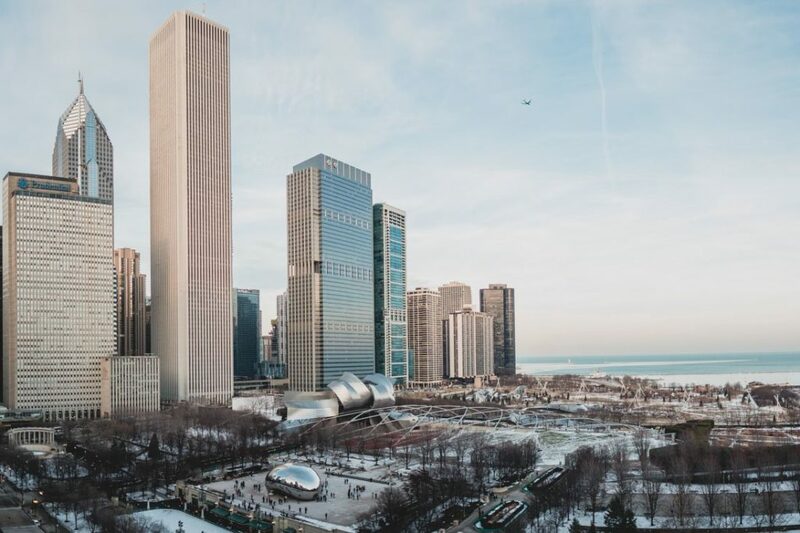 Pull on some skates and spin around Millenium Park at the Mccormick Tribune Ice Skating Rink then visit the famous bean to take a Chicago selfie! Millennium Park is where many of the festive events take place in the city including the Christmas Tree Lighting Ceremony. Other hotspots include the 45-foot Christmas tree in the Walnut Room at Macy’s and the European style Christmas market at Christkindlmarket at Daley Plaza in downtown Chicago. Chicago’s Magnificent Mile (Mag’s Mile) also puts on a great show with lights and Disney characters to celebrate the start of the holidays. There are a few spots for sledding, check out Cricket Hill at Montrose Harbor, Palmisano Park in Bridgeport, the Dan Ryan Woods and Soldier Field. Lots of choice during your trip to Chicago this Christmas. No matter what time of year you visit Las Vegas, you’ll find loads of fun things to do. But Christmas in Vegas really is one of the hottest times to holiday. Although the temperature drops to 60 degrees Farenheight, the fun does not stop. On the first night of your visit, grab a hot chocolate to go, and head to Lake Bellagio to catch one of the famous fountain shows. It is so much fun to see the water dance to the sounds of familiar holiday tunes! Enjoy the attractions with fewer people, Vegas is noticeably quieter during the holiday season. Another delightful holiday-time activity in Vegas is viewing the extravagant displays set up many of the resorts. You definitely should not miss the lobby of the Wynn Resort and the Conservatory at the Bellagio Resort, where you will find classy depictions of winter and holiday scenes. It wouldn’t be the holidays without seeing the Nutcracker, but reserve in advance if you want to bag the good seats. Check out the one million annual holiday lights at the Ethel M Chocolate Factory and Cactus Garden. Next, head to the Town Square, where man-made snow flurries create magic each night during the holidays! Just because you are holidaying in Las Vegas, it doesn’t mean you have to miss out on a traditional Christmas meal. Book a table for a holiday meal at any one of several fine dining restaurants or enjoy a buffet but expect long lines. Almost everywhere is open on Christmas Day. Bundle up, because average temperatures in Vegas can drop from a balmy 60 degrees Fahrenheit during the day to a near freezing 32 degrees at night. One of the good things about holidaying in Miami is the weather. 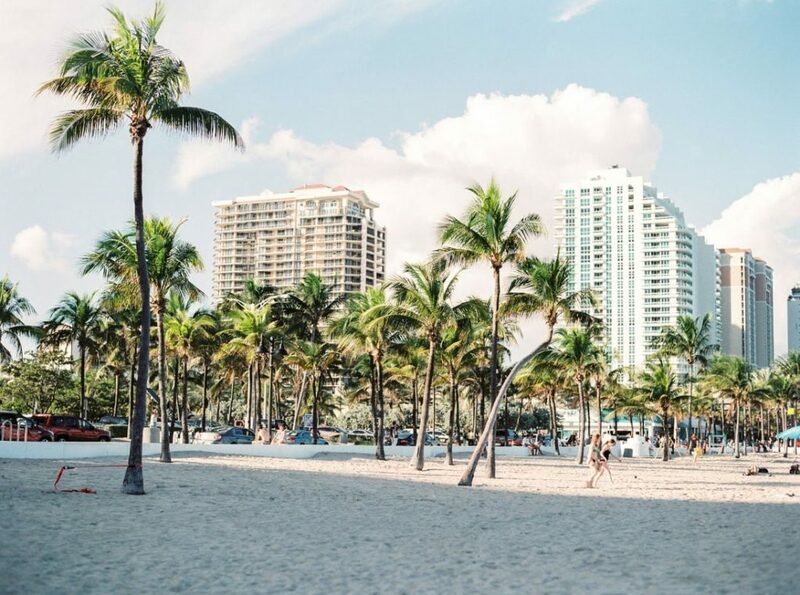 With an average temperature of 80 F (26.6 C) Miami definitely appeals to winter-weary travelers looking for a weather respite. There is a lot more to the self-proclaimed “Magic City” than the weather. You know the holidays have arrived when you see the blazing, colorful holiday lights at Santa’s Village off Palmetto Highway. Every year it seems the decorations get more and more elaborate. One of my favorite holiday activities is visiting the Christmas markets that sprout up all over the city like colorful mushrooms. Miami being the capital of Latin America, there is definitely a heavy Latin – particularly Cuban – flavor that permeates the holidays. Signs pop up in food stores advertising ingredients for “Noche Buena” the holiday meal celebrated by many Latin Americans on December 24. The traditional dishes include lechon (roast pig), moro (black beans and rice) and fried plantains all washed down with Spanish cava. And the music is non-stop! Every club, bar or restaurant with even a couple of square feet of space transforms itself into a dance extravaganza and everyone participates. It’s about this time that the announcements for New Year’s Eve parties start hitting the airwaves. And nobody does New Year’s Eve like Miami (well, except for NYC, of course). On December 31st many streets close and restaurants pour onto the sidewalks festooned with balloons and streamers. Many restaurants charge an additional 15% holiday fee on this day. The hours count down and, close to midnight, people start heading to the beach where they know the exhilarating fireworks display won’t disappoint. And they don’t! Maybe I’m biased as a local, but I think one of the best places to celebrate Christmas is in New York City. With the Rockefeller Center Christmas tree all lit up, the department store windows decked out in full holiday cheer, and the bustle of the winter markets and ice skating rink at Bryant Park and Rockefeller, you just might find yourself skipping down sparkly Fifth Avenue while humming Deck the Halls! I love seeing the Radio City Rockettes or the Nutcracker at the New York City Ballet. A pre-theater glass of wine at the holiday wonderland, Rolf’s, is a great way to round up a festive night in the Big Apple. Just remember, December weekends in NYC are crowded. Plan extra time to get around and, when possible, travel via the subway underground. It’s by far the quickest way to avoid NYC’s legendary holiday traffic and maximize your time. If you’re lucky, you just might get some snowfall, which only adds to how pretty the city looks! And, a coating of white absolutely warrants a stroll through fairy tale Central Park. Just be sure to dress for the weather! Temperatures in NYC in the winter can range from the comfortable 40s and 50s to the downright wicked in the teens and single digits. The best way to make sure you keep that holiday spirit as you walk around the city is by covering your ears, wearing a heavy winter jacket, and warm, waterproof shoes or boots. There is really nowhere better to spend Christmas than Vermont, USA. I may be biased, having lived here for more than half my life, but Vermont (and the New England region in general) are the ideal spots for a classic Christmas. First of all, this state is where you want to go if you’re searching for a White Christmas. Climate statistics point to the chance of snow on the ground in Vermont on December 25th is somewhere around 75% or more. Pretty good odds! Vermont is like a Christmas village, with quaint main streets, charming steepled churches, and an abundance of Christmas trees. One of the best traditions for the holidays in Vermont is to pick and cut your own Christmas tree. 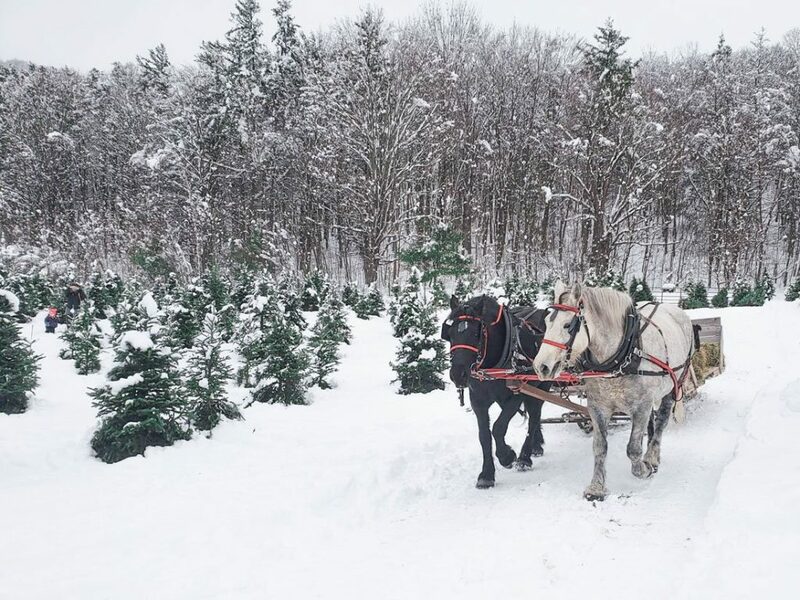 We recently discovered a Christmas tree farm not far from Vermont’s biggest city (Burlington) where you can ride in a horse-drawn sleigh up to find your tree. Once you’ve chopped it down, enjoy hot cocoa and cookies by a wood-burning fireplace. Aside from that, in Vermont, you can enjoy tons of wintry sports and activities, including sledding, skiing, ice skating, and much more. Simply put, Vermont is the Christmas dream here in the USA. Portland, Oregon is one of the USA’s coolest cities and as the temperatures drop (and the rain pours), it maintains its core values: craft beer, respect of the city’s makers, and community action. There are plenty of opportunities to see Christmas lights in Portland. Oregon Zoo puts on a big seasonal show, Pittock Manion is decked out by volunteers and there is even a ship parade where boats sail the Willamette and Columbia River all lit up. The locals at Peacock Lane also light up their houses for you to see. All of that festive cheer works up a thirst! 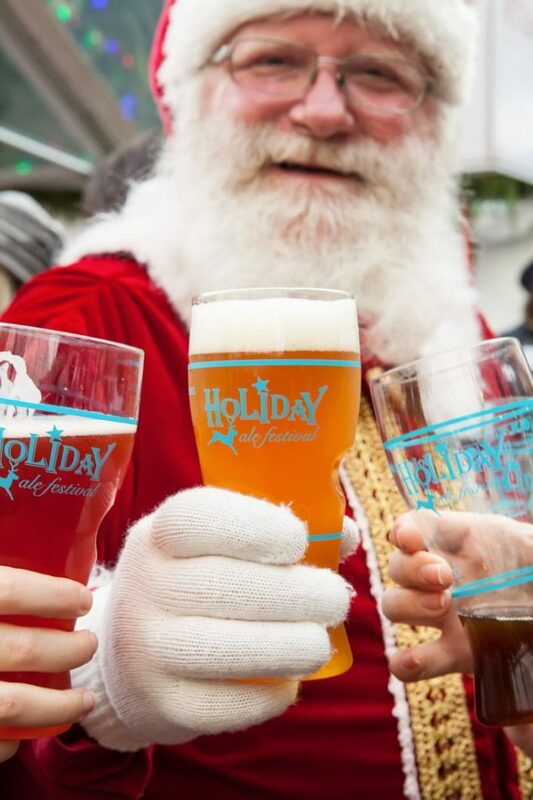 Don’t miss your chance to try 50 ales at the Holiday Ale Festival at Pioneer Square (image credit). Often overshadowed by nearby NYC, Washington is one of the most underrated places in the US to celebrate Christmas. Having grown up just outside of the city, Christmas has always been my favorite time of year in the nation’s capital. For one, there are two national Christmas trees. That’s right, TWO! One of them is located in front of the U.S. Capitol Building and provides one of the most picturesque DC Christmas settings. The other tree is located in front of the White House. That tree is also surrounded by 56 smaller trees, one for each US state and territory. Speaking of the White House, it gets a makeover each holiday season. The President’s home is open to public tours all year, but Christmas is the best time to visit. The entire building is decorated with a multitude of trees, fresh pine garland, twinkling lights, and a gingerbread replica of the White House itself. My favorite DC Christmas tradition is the performance of Handel’s Messiah at the National Cathedral. The Messiah was written to be performed in just such a venue, and the annual performance is always a highlight of the season. Weather in DC in December is usually on the chilly side, but mild. High temperatures are typically in the 30s/40s F. Many restaurants are closed on Christmas Eve and Christmas Day, but a number of them do offer special holiday meals on those days. Excitement and preparation for Christmas in Toronto starts right after the American Thanksgiving. For me, Christmas in Toronto starts when the Hudson Bay Company puts up its colorful window displays and Eaton Centre in the adjacent building puts up its gigantic Christmas tree which is covered in red twinkling lights. I visit every year to check them out. They instantly put me in a festive mood. This is also around the time when the Christmas tree at Nathan Phillips Square is illuminated. The illumination ceremony includes some great fireworks display and performances by Canadian artists. I also look forward to the Christmas market in Distillery district which opens in mid-November and lasts up to the big day. This gives people an entire month to do their shopping. This year the newlywed couple, Justin Bieber and Hailey Baldwin also showed up to celebrate. Tip to save money – visit during weekdays when there’s no entrance fee. If you are looking to enjoy Christmas on a budget, then visit Toronto Waterfront. This is one of my favorite free things to do in Toronto any time of the year. However, during Christmas, the spectacular light display near Toronto’s Music Garden and the Natrel skating takes my sense of awe, for the waterfront, to a whole new level. Other popular things to do during this season is to visit the flower display in Allan Garden conservatory, joining the festivities and having a traditional Christmas dinner at the Black Creek Pioneer village, seeing the winter wonderland display at Yonge-Dundas square just to name a few. Mexico City is one of the biggest cities in the world, however, it feels homely during the winter holidays. The population of Mexico, in general, is very religious, thus, it’s common to celebrate Christmas with the family. Also, families in Mexico are quite big, so it’s not unusual to see the gatherings of 30, 50 or even 80 people. When we visit Mexico City (my husband is Mexican/Spanish), we always have a family gathering with a large Christmas tree and a Christmas nativity set up at home. On Christmas Day, Mexicans usually go to their local church and later stay at home with the family. Mexico City is a lovely destination for Christmas holidays because it gets decorated for Christmas, but at the same time, it’s very warm in winter (during the day it could easily be 75 degrees Fahrenheit, so it’s quite a unique and unusual situation especially for Europeans and Northern Americans (from Canada and the Northern states in the US). There 3 major holidays around the Christmas time in Mexico: Christmas, NY and the last one is the 3 King’s Day on the 6th of Dec. It’s common to gather together and eat a special sweet bread called Rosca. New Year is usually quite calm in Mexico City, however, there are fireworks in the downtown and parties around Zocalo and Angel. One of the most unusual places to spend Christmas is Balgue, the smallest village in the island of Ometepe, in Nicaragua. 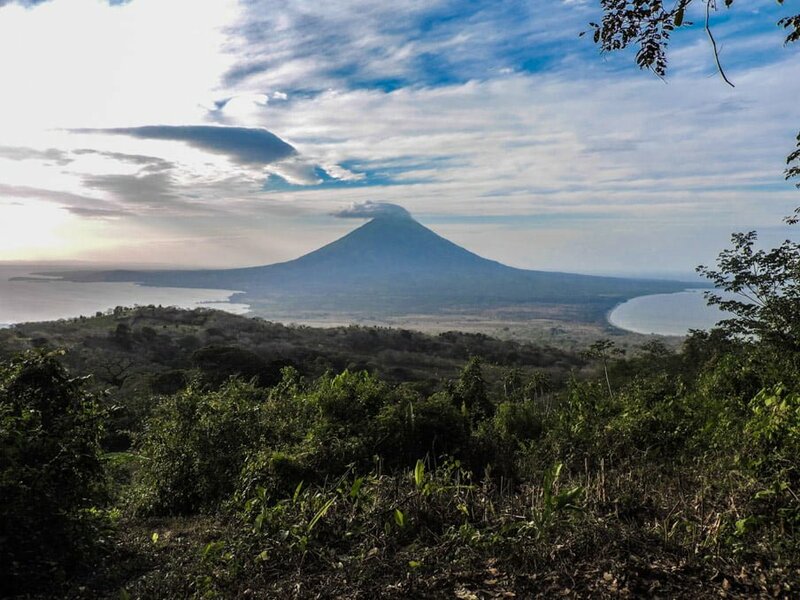 Famous for the presence of two volcanoes and its natural beauty, Ometepe isn’t exactly a happening destination in terms of Christmas celebrations, which in a way is what makes it completely charming and worth it. If Ometepe keeps Christmas celebrations low key, in Balgue they almost go unnoticed. It’s all about staying in the family, sitting together playing the guitar and singing traditional tunes. What I loved about it is that it’s not commercial at all, but it truly is about sharing the moment with people you love and care about and welcoming others into your home. As the smallest village in Ometepe, Balgue doesn’t have many sleeping options, most visitors stay at Finca Magdalena, a very modest hostel kind of place at about 30 minutes walk (there is no road access) through the forest. Travelers hardly venture to the village during the night, because walking back means crossing the forest in the dark. Celebrations at Finca Magdalena are thus very similar to those in the village: a bottle of Nicaraguan rum, a guitar or two, and people gathered around the table for an impromptu jam session. It’s completely free, and a lot of fun. After backpacking South America for many years, my favourite place to spend Christmas in Medellin, Colombia. Medellin has one of the most elaborate Christmas celebrations on planet earth. Not only visible on the streets through the 26 million Christmas lights, but also there are other festive traditions that are religiously celebrated. The most important tradition of all is spending time with the family. Families celebrate by watching the Alumbrados annual Christmas light display and during Novenas (16th – 24th December), we all get together to eat, pray and recite prayers from a book that is passed around between the family. Why wait until Christmas day to open presents? Here in Medellin, we open presents on the 24th of December and it’s normal to do secret Santa style gifting. For Christmas in Medellin, expect a moderate 75c temperature. The Paisas, people from the Antioquia region of Colombia, love to celebrate so you will not be disappointed by this special event. 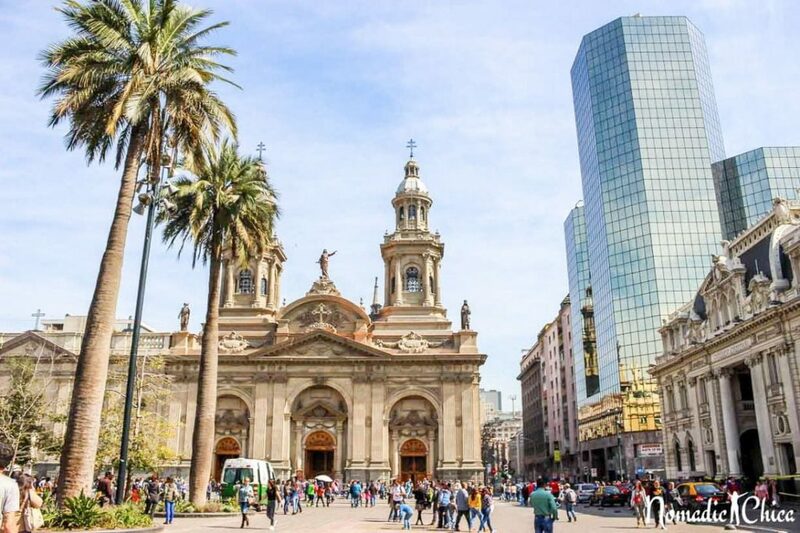 My favorite place to spend Christmas is Santiago de Chile. The best part about spending Christmas in Chile is that it is summertime so days and nights are warm which means you can wear light clothes and spend lots of time outside. There are not huge events for Christmas in Santiago as its mostly a private celebration with family. People who are very Catholic go to church before having dinner with the family on the 24th of December. Then, at midnight Santa Claus, “Viejo Pascuero” brings gifts and the family opens them around the Christmas tree. We prepare a traditional drink for the season called “Cola de Mono” or literally Monkey’s Tale made out of milk, sugar, coffee, and alcohol, served cold with some cookies or Christmas cake. If you are not invited to spend dinner with a local family, make sure you make reservations in your favorite restaurant, many actually close for the festive holidays so it could be hard to find a place to spontaneously have dinner. There’s public transportation running the whole night as well as Uber so you won’t be stuck when trying to get home like in other destinations. If you stay until New Year’s Eve you will see beautiful firework shows in several points in the city but my suggestion would be travel to the coastal city of Valparaíso, where they throw one of the best and biggest firework shows in the world. Whether you are looking for a white Christmas in the States or a beach trip to Central America, there are many ways to celebrate Christmas in the Americas! This guide has shared expert advice from travel bloggers on their favourite places to spend time in December. What a fun article! I love to see where every one is spending the holidays and it’s good to see that we aren’t the only ones shirking our usual family Christmas! You guys have a fantastic newlywed Christmas up in Canada. I’m sure it’ll be remembered forever. Thank you Laura! Not quite a mrs, yet but I am looking forward to our first stint together. Have a ball in Cuba! I had a a tear in my eye putting it together, Sarah. I wish you a fun festive period in the Netherlands! I am loving this North American version of Christmas! Are you excited to be away from home? I’d still love to have my first white Xmas, so hoping for a little sprinkling wherever we may be (possibly Georgia, Armenia or Turkey)! I’m excited about spending it with Craig (awww) but will miss the family! I’m not Christian either but I love things that sparkle – Christmas lights are awesome! Merry Christmas to you too Cai. That sounds like a very extended festive period! I’m not Christian either but I love Christmas! The lights, the spirit, everything! Although in Portugal you don’t have a lot of that. This year I’m going to spend Christmas abroad as well! I’m going to New York city! Happy holidays! Fabulous! 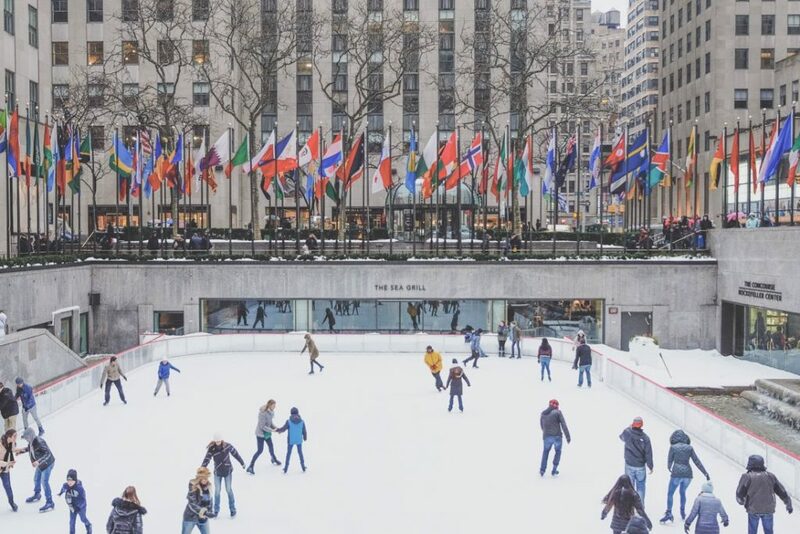 NYC will be incredible at that time of year – wrap up warm! Merry Christmas to you too Marta. I’ve spent Christmas abroad a few times including Sydney, a cruise ship, and Austria skiing. I definitely prefer the cold locations for christmas as sunbathing outdoors on Christmas day just feels bizarre!! I’ve never had a sunny Christmas yet! I am missing the warmth after three months of fall / winter though and looking forward to Orlando in Jan. Hope you have a wonderful Xmas Anne. Sunny just feels bizarre to me for Christmas unless it is a super cold day in the UK. I have only done a ski trip once over Christmas and that was cool. I would be up for doing that again! Maybe next year as this year we are at home and then heading to Monaco for NY. Have you been as I would appreciate any tips on how not to come home broke? Haha! I’ve not but would love to go. It looks stunning. AirBnb?! Hotels sorted but would like to live like a millionaire on the budget of a pauper. After all I need to write about how to travel the globe 4 less which might not quite fit with spending hundreds on helicopter trips, fancy balls and gambling in the casino. 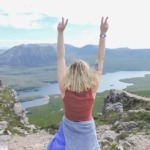 Damn, I knew I should have set up a blog dedicated to Travelling like a millionaire! Have a great Christmas and congratulations on the engagement. Was it recent? I have visions of a Bond movie with that description! Engagement was in October, Hallowe’en, my favourite day of the year! I feel your pain budget wise, we fly out of Costa Rica in March but I don’t think we’ll get to see much of it, Europe plans are changing slightly too. Can’t complain though! I am loving your North Am snow! We went to Whistler, skiing, last weekend – what a thrill. Merry Christmas Kimberly.